On September 7th 1936 Charles Hardin Holley was born in Lubbock, Texas to Lawrence and Ella Holley. They named their youngest child after his two grandfathers, Charles and Hardin, but Ella thought his name was too big for such a little boy so she called him…Buddy. Yes, the one and only Buddy Holly was born in West Texas. Buddy started his musical career playing at car dealerships as well as a Sunday gig on a local radio show where he and a friend would play songs requested by local residents. Buddy later signed a contract with Decca Records; however the company listed him as Buddy Holly (with no e) …. misspelling his name. He was young and afraid the opportunity may never happen again, so he signed the contract as Buddy Holly and made that his professional name. One of my first stops on reaching the ‘high plains’ of Lubbock was to visit the Buddy Holly Center, that is once I’d eaten some melt-in-your-mouth beef brisket, and green chili sausage at Evie Mae’s Pit Barbeque – often listed in the Top 10 of Texas Monthly’s Top 50 BBQ joints in the state – however, be prepared for plastic cups, plates and cutlery…and no alcohol. Located in the historic Railroad Depot Entertaining District, no visit to Lubbock is complete without paying tribute to this iconic Rock and Roll pioneer. 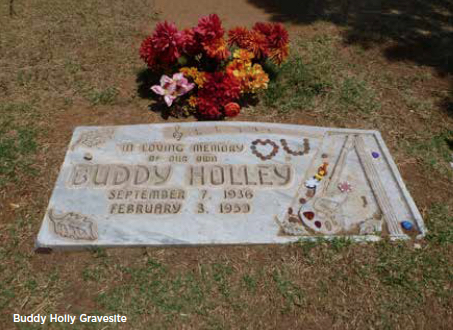 The Buddy Holly Centre provides a facility that features a wide variety of programs encompassing music, music history, the visual arts and educational outreach initiatives. In 1999, the Buddy Holly Center opened its doors to the public as a museum and fine art gallery. In the museum (built in the shape of a guitar) you can see a permanent exhibit of his life, memorabilia and music (in his short-lived career he had 25 hit records), as well as his black horn-rimmed glasses that were found in the plane wreckage that took his life on February 3rd 1959 in Iowa. Also inside a glass case is Buddy’s Fender Stratocaster that he was famous for playing. Later that afternoon I swung open the doors of Lubbock’s National Ranching Heritage Center and was greeted by Sue Jones, the coordinator of outreach and communications. After a short tour of the museum (I didn’t have time to visit all seven galleries featuring western art, photography and artifacts) we headed outside onto their 19-acre historical site – located on the northern boundary of the Texas Tech University campus. Most tours of the park and museum are self-guided, but for my pleasure I had Sue as my tour guide. Inside the park are 50 structures alongside a mile-and-half of paved pathways, where each turn reveals a house, cabin or barn, some dating back over 200 years, as each building details another chapter in the history of ranching in North America. The NRHC historic structures have been chronologically arranged to exhibit the evolution of ranch life from the late 1700s through to the mid-1900s. What was surprising as I toured the site with Sue was that all but one of the structures were relocated, restored and furnished for period correctness – at one point I felt much of this history was familiar, having watched with interest the ‘Barnwood Builders’ renovation programs on HGTV for the last couple of years. Before dinner I drove out of town to pay a visit to Llano Estacado Winery for a well-deserved chance to sample some local wines. What I already knew was that Lubbock was primarily well-known for its cotton, peanuts and sorghum crops (used for silage, hay or grazing) but surprisingly the area also boasted five wineries, and that Llano was not only Texas’ second oldest winery, but that it’s wines had been enjoyed by both President George W. Bush and Queen Elizabeth II. He smiled at my obvious delight when I said, “Drinking suits me,” as he proceeded to open some of his finest wines. We sampled bottle after bottle – eight in total – tasting some of the best wines I’d had in years. For dinner I drove to an area of the city known as Cactus Alley, where tucked into the corner of a sun-drenched courtyard was a local restaurant, Concina De La Sirena (the Mermaid). This delightfully decorated restaurant had made a name for itself with its Latin American cuisine. It was Thursday night and every table was bulging with locals, except for one spare stool I found at the turquoise-blue tiled, white-walled bar. The Maître d’, called Cat, told me her daughter Jessica was the owner and head chef. Cat then explained, “We opened two years ago and we’ve been so busy we’ve had to expand four times during that period, all with no advertising, just word-of-mouth.” I could see why. From La Sirena’s menu I chose Poblano Fries as an ‘aperitivo’. For the next course I chose Peruvian style Ceviche Tapas and Pulled Quail Empanadas Tapas – the quail was especially tasty, making me feel guilty as I have a covey of quails in my own garden. With a second glass of red wine in hand I ordered Stacked Enchilada – Chimayo red chili, black beans, calabacitas (a Mexican flavoured vegetable), lettuce, heirloom tomato pico and corn tortilla, topped with a fried egg! This is a dish anyone would have a hard time resisting. Lubbock is home to Texas Tech University, where the arts are an important part of the curriculum, and as such TTU has established a number of initiatives to foster the cultural and intellectual life on campus (the second largest in the USA). One way they have done this is by building and maintaining a collection of public art created by some of the leading artists in America. To date, the university is home to more that 100 sculptures! 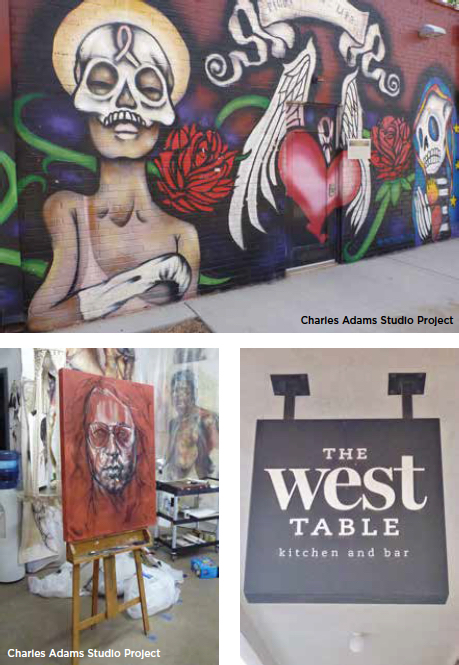 Lubbock has also developed a ‘Cultural District’, which includes the Charles Adams Studio Project. A privately owned non-profit organisation whose mission is to cluster artists who live and work on site by maintaining an inclusive environment that’s mutually beneficial for all the working artists, curators, galleries and studios. Also rising from the ground nearby will be the new Buddy Holly Hall of Performing Arts & Sciences – the cultural hub of Lubbock and the cornerstone of downtown revitalisation. In addition to a 2,200 seat main theatre, the venue includes a 425-seat studio theatre, a 6,000 square foot multi-purpose room, the new home to Ballet Lubbock and outdoor performance areas. With a hybrid design and a wide spread array of amenities I was told the new centre is unique and unlike any venue of its kind in the USA. Another arts project has sprung to life in what was once a city fire station, now modernised and added to the LHUCA (Louise Hopkins Underwood Center for the Arts) a contemporary visual, performing and literary arts facility. Its campus includes visual art galleries, a 159-seat theatre and rehearsal hall, an outdoor plaza with stage, a working clay pottery studio and ongoing special events such as the Flatland Film Festival (every September) and Lubbock Book Festival (every October). 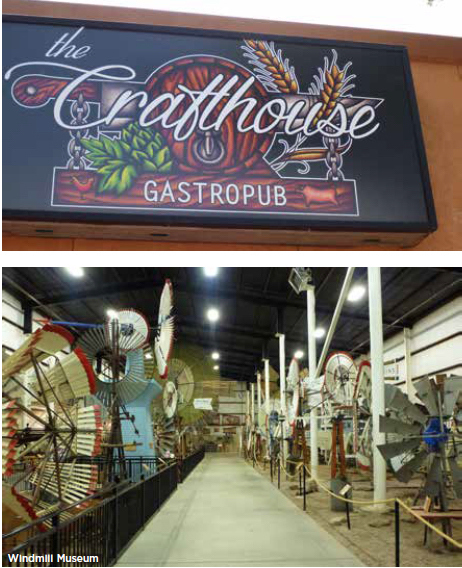 After devouring a huge Texas burger for lunch at The Crafthouse Gastropub – another place full to overflowing, I headed to an urban winery at McPherson Cellars in the heart of Lubbock’s Depot Entertaining District. A pioneer in the wine growing industry for over 40 years, owner and winemaker, Kim McPherson has beautifully restored the city’s old Coca Cola bottling plant into a world class winery. With over 600 awards in state, national and international competitions, this is one place you have to try a wine tasting experience. It’s hard to believe but in Lubbock they can claim to have the largest windmill museum in the world. The American Windmill Museum is spread out on 28 acres of rolling hills with a giant aircraft-type hanger housing most of their collection. Home to more than 200 rare and fully restored windmills, visitors leave with a great understanding and appreciation of the American-style, water pumping windmills that are still essential to life on the Texas plains. Later that evening I stepped into an upbeat, upmarket restaurant in the old downtown district. With marble floors and high= ceilings, The West Table opened in what was once a J.C. Penny store. It had a slightly minimalistic and industrial feel to the fine dining restaurant, but the adjoining rooms have been transformed into a more casual bar and café. Sitting next to the owners, Cameron and Rachel West, at their bar, I ordered a light meal; a spicy chicken soup with rice and thin pasta topped with cilantro, with a side order of warm crusty bread. It was a great way to spend my last night in Lubbock, eating hearty food and drinking bold Texas red wines as the warm winds off the Texas plains blew grit along downtown’s old autumn red, brick-lined streets. If he were still alive today Buddy Holly would be 82 years old. I thin he would have approved of the monumental changes to this high plains agricultural hometown city of Lubbock – this was certainly ‘the day the music lived on’. The author would like to thank Travel Texas and Visit Lubbock for coordinating all the ground arrangements during his visit.